Nowadays, there is no more a chaos of cables, but almost everything is connected with wireless technology. For example, you can remotely turn on and off the TV, coffee machine or even monitor babies by some wireless devices. Along the many benefits, people are exposed to numerous dangerous effects of the electromagnetic radiation every single day. Have you ever wondered is the Wi-Fi device safe? This is rather a controversial issue because there are two extreme options concerning the Wi-Fi connection. One side claims that it is utterly safe and they favor the idea of “smart” house where everything runs on Wi-Fi while the other side would like to build a Faraday Cage around them only to protect themselves. The real truth lies in between these two sides. WiFi does not immediately cause diagnosable illness. For this reason, many of us choose to ignore that it can have any effect at all. However, it can interfere with our bodily functions which may eventually progress into diseases like cancer and neurodegenerative diseases after long-term exposure. Because these are complex diseases that develop over decades, it’s hard to conclusively show that the increase in wireless signal exposures directly causes the diseases. International Agency for Research on Cancer (IARC) considers wireless radiation as a class 2B possible carcinogen due to limited evidence. These small number of studies are leaning towards showing that electromagnetic radiations, including WiFi, are not safe. In the Lancet article outlining their considerations, that IARC states that epidemiological studies that follow humans who use WiFi and cell phones for a few years are not conclusive. However, rodent studies that follow the animals throughout their lifetime find that wireless radiation does cause cancer or worsen cancer prognosis. The same animal studies also observed other changes in the brain and blood-brain barrier in animals that are exposed to the radiation. The limited evidence in humans may be why regulators are claiming that this type of radiation is safe. 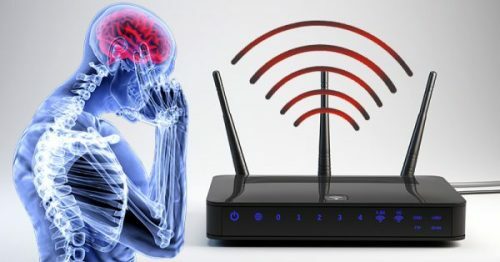 However, some anecdotal evidence, such as how Canadian families in Ontario are noticing headaches and brain fogs in their children, suggest that WiFi may not be healthy, so it is probably better to err on the side of caution. It is even more important to protect children and developing fetuses from radiation as their small and growing bodies are more vulnerable to radiation than adults. Many products on the market aim to help protect babies in utero from WiFi radiation (like this belly armor blanket and even this belly-shielding band for pregnant moms). First of all, reduce your use as much as you can because of the long-term negative effects. Those who are in favor of the Wi-Fi use would probably state that even smoking is harmful but people use it. Everyone should be sleeping at bedtime, and WiFi signal may interfere with the brain during sleep, so it is a good idea to turn it off before going to bed. This allows the body to rest more deeply. By turning it off at night, you are effectively cutting down the exposure by 33%. (Aside from the WiFi reduction, many security experts also recommend turning off your internet when not using it). Also, because many people browse the internet mindlessly at night, some may also find that having a WiFi curfew improves their marriage because they become more present with their spouse. Many router models will have features that make it possible to automatically shut off WiFi connection and turn it back on at the same time every day, which will be useful for this purpose. In this way, you will reduce your exposure to Wi-Fi only to few hours a day and still be connected. Giving up WiFi altogether is the healthiest option. It may sound daunting, but it is possible and may mitigate several health issues down the line. In addition, you will enjoy more consistent and faster internet when directly hardwired in. It is certainly more work and not doable for everyone, but something we are (slowly) attempting. Ethernet hub – if the one you have doesn’t have enough ports for every device and everyone to use. Then can be plugged into an existing hub that you already have in order to expand the number of ports. Long ethernet cables – to allow everyone to connect from anywhere in your home. Ethernet adaptors – makes it possible to connect devices that don’t have ethernet ports, including tablets, smartphones, and some computers. It is also a good idea to use wired peripherals like keyboards, mice, and headphones instead of wireless ones to reduce exposures to electromagnetic radiation. If that all seems complicated to set up, I’d recommend asking someone to help. My tech-savvy brother was the lucky recipient of my questions. With new wireless technology, wireless-enabled devices with bells and whistles are on sale every single day. Smart home thermostats, Bluetooth-controlled cookers, wireless baby monitoring system, and smart beds might make life easier, but they may not be as safe as we think. Such technologies are still very new. These devices use many forms of wireless technologies, for which we don’t fully understand the long-term health consequences. For these, less is more. Cell phones and tablets emit electromagnetic frequency when the receivers are turned on. Because we typically use these devices very close to our bodies for extended periods of time, exposure levels can be very high. Therefore, it’s important to keep them on airplane mode, especially when they are around children. Remember also to teach children and caregivers to turn these devices on airplane mode to reduce WiFi and electromagnetic exposures. You are not able to eliminate completely the exposure to wireless radiation, especially if you live in some urban area.